Whether used for companion planting or integrated in a garden's overall design, many plants have temperature, soil, water and light requirements similar to a lemon tree (Citrus limon) and grow well with it. 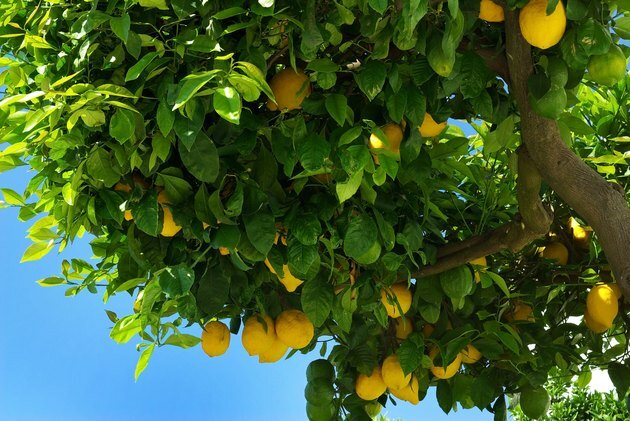 The lemon tree is hardy outdoors all year in U.S. Department of Agriculture plant hardiness zones 9 through 11 and reaches a height of up to 25 feet. As they are for all citrus trees, well-drained soil and regular water are essential for a lemon tree. Lemon trees have glossy, evergreen foliage. The idea behind companion planting is that certain garden plants enhance the growth of other plants. One way this happens is through the attraction of insects that feed upon the pests that may cause gardens to fall out of balance. A lemon tree can have many pests, but annual herb plants such as dill (Anethum graveolens) and coriander (Coriandrum sativum) attract beneficial insects that include green lacewings and ladybugs, which have larvae that consume pests such as aphids, mites and scale. Another citrus pest is the mealybug Perennial plants such as yarrow (Achillea millefolium, USDA zones 3 through 9) and black-eyed Susan (Rudbeckia fulgida, USDA zones 3 through 9) attract one of the mealybugs' natural enemies, the hoverfly. All of these plants are effective companions for a lemon tree. Another way to select companion plants for a lemon tree is through garden design style. A lemon tree is a classic focal point for a Mediterranean-style garden. The Mediterranean-area native bay laurel tree (Laurus nobilis, USDA zones 8 through 10) and the U.S. native evergreen Carolina cherry laurel (Prunus caroliniana, USDA zones 7 through 10) complement a lemon tree and can be pruned into formal shapes if desired. Bay laurel grows up to 60 feet tall in its native area but usually reaches 3 to 10 feet tall elsewhere. Its leaves and oil, however, cause an allergic reaction in some people. Carolina cherry laurel grows 20 to 40 feet tall. Provide contrast for your lemon tree in a Mediterranean-type garden with perennials that feature textured silvery or gray foliage. They include lavender (Lavandula spp., USDA zones 5 through 10), and artemesia (Artemisia 'Powis Castle,' USDA zones 4 through 9). If you prefer a Mediterranean ground cover near your lemon tree, then plant creeping rosemary (Rosmarinus officinalis 'Prostratus'), which is hardy in USDA zones 8 through 10. The sweet scent of blossoms in spring precedes the fruits on a lemon tree. Combining fragrant plants with the tree can create a garden that is a feast for the senses. For example, sweet olive (Osmanthus fragrans, USDA zones 9 through 11) also has perfumed blooms in spring, as do certain roses (Rosa spp., USDA zones 4b through 10). Plants that have aromatic foliage include scented-leaved geraniums (Pelargonium spp., USDA zones 10 through 11) and lemon verbena (Aloysia citriodora, USDA zones 8 through 10). A lemon tree is right at home in a garden with vegetables, herbs and other fruit plants. Try a dwarf lemon tree in a raised bed with colorful Swiss chard (Beta vulgaris subspecies cicla var. flavescens), which is an annual, garden strawberries (Fragaria x ananassa, USDA zones 5 through 8), herbs and plants that have edible flowers, such as nasturtiums (Tropaeolum spp.). Another option is to combine a standard-size lemon tree with other citrus trees to form a grove.